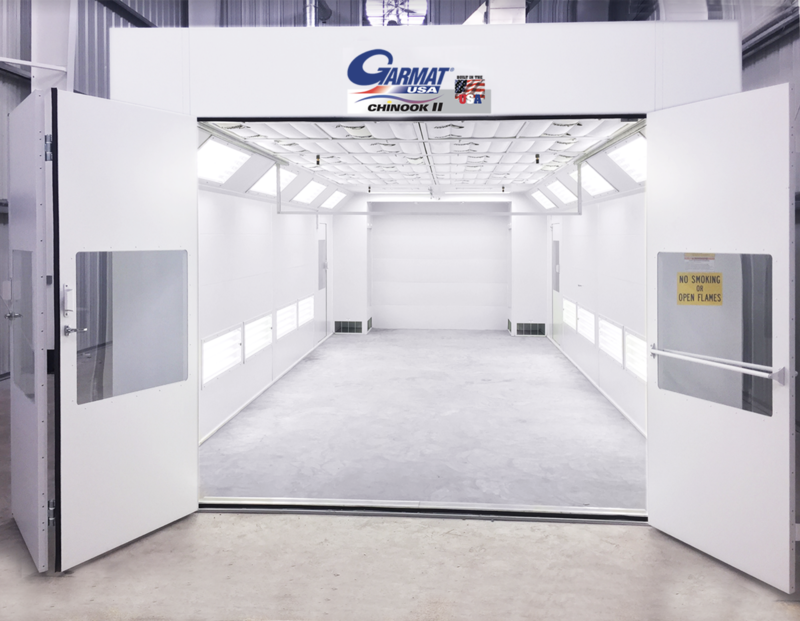 Garmat® USA’s Chinook II provides across the board savings without compromising production. The air flow surrounds the vehicle and is drawn to the filters at the rear of the booth. Bag filter design provides 54% more useable surface area than competing brands. The Chinook II cabin is constructed of durable powder coated fully insulated solid interlocking G-90 galvanized steel wall panels. Long lasting durable PLC control panels designed and manufactured in Garmat’s ETL listed shop located in Englewood Colorado. Features PLC which sequences spray and bake mode temperature settings. User friendly interface. Bake: Rapid temperature rise, fully automatic purge and cool-down cycles. Recycle on Bake: Reduce your fuel costs with recycle on bake. Up to 90% of the heated air is recycled back into the paint booth during the bake cycle, decreasing fuel costs and ultimately saving on overall operating costs.